Punchline: Not a routine love story! Arjun (Sushanth) had a break up and is happy being single. But his overbearing mother (Anu Haasan) wants to marry him off. Arjun meets Anjali (Ruhani Sharma) at house in private (pelli choopulu). He tells her that he is not interested in marriage and he has certain goals to fulfil before getting marriage. But, Anjali has a big issue. She need to get married as soon of possible due to certain compulsion. Rest of the story is all about how these two reluctant youngsters fall in love! Story - screenplay - direction: The story has an interesting conflict point. A guy who doesn’t want to get married. A girl who is compelled to get married. And the situation changes in no time. Now, the guy wants to get married and the girl doesn’t want to get married. The character of the girl looks independent and strong. Yet she is confused and vulnerable from inside. It is very difficult to write scenes to such a story. The character of the girl looks foolish and irritating sometimes, but her past and her thinking pattern makes us feel empathise with her. Debutant director Rahul Ravindran is very honest in his approach and sincere in his storytelling (except for the unnecessary and forced idli bandi song). After Sekhar Kammula, I have seen such a director who gives so much value and weight to his heroine character. However, there are few hiccups. There is no need to show Rohini’s character in such a realistic manner. The entire film looks like hero trying to impress and win over heroine without hero having any individually. The second half meanders (the thief - cop drama, grandma asking for juice in midnight). At the same time, thief - cop drama works partially (liked the scenes where heroine walks away from police station as Narasimha title song plays in the backdrop. The orange juice episode is hilarious. Even though second half is tedious, the director gives a good ending to all the characters and gives us a happy feeling while we walk out of the theater. Narration of the film is snail-paced. Other departments: Prashanth R Vihari’s music is very soothing. Except for solo solo (idli bandi song), all other songs are nicely placed. They have used a song each for the beginning song and end song as well. Mellaga Mellaga song is wonderful. Background music is also apt. Cinematography by R Sukumar is neat and goes well with romance genre. Dialogues written by Rahul Ravindra are good and contemporary. He has good understanding of women and it reflects in his dialogues. Editing is alright. Production design is good. Production values by debutant producers are decent. 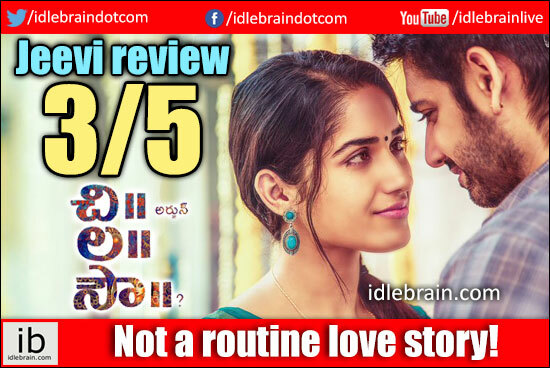 Analysis: Director Rahul Ravindran has good story and a great female character. He infused very good comedy through Vennela Kishore in few scenes. First half of the film goes smoothly, but second half looks stretched and is a bit tedious. Narration of the film is little slow. Despite a few hiccups, Chi La Sow is a good attempt at delivering a different love story with strong family values!